Click here for complete dynasty running back rankings. 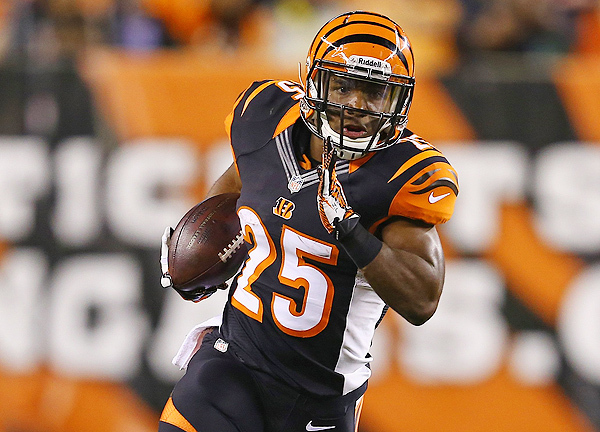 Top five has a new guest with Gio Bernard entering at number five. The other four remains the same with LeSean McCoy, Jamaal Charles, Eddie Lacy, and Doug Martin. Big risers this month include a couple of rookies including Devonta Freeman up to 29 from 39 after an impressive rookie camp; James White up to 53 from 61 as a potential Shane Vereen replacement; Storm Johnson up to 57 from 69; and Isaiah Crowell up to 63 from 68. The drops this month include more rookies – Tre Mason down to 34 from 29; Jeremy Hill to 38 from 33; Knile Davis to 55 from 49; and Jacquizz Rodgers to 69 from 64. This entry was posted in Running Backs and tagged devonta freeman, doug martin, eddie lacy, Gio Bernard, isaiah crowell, jacquizz rodgers, jamaal charles, james white, jeremy hill, knile davis, lesean mccoy, storm johnson, tre mason, updated dynasty running back rankings 2014. Bookmark the permalink.